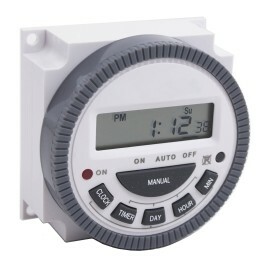 Our 12V seven day automatic timer enables a gate opener or other accessory to work during specific hours. The GTO TMGTO12V is a Programmable Digital Timer designed for use in either industrial or commercial gate applications. It features a micro-controller & CMOS quartz digital timer for 24/7 hour operation. With up to 10 programmable settings, you are ensured accuracy to-the-minute. The digital timer also has a manual override button for those occasions that don’t fit into the normal programming sequence and an LED ON/OFF indicator light. The TMGTO12V operates at 12V AC/DC allowing you to connect it to your GTO gate operator without draining the battery.